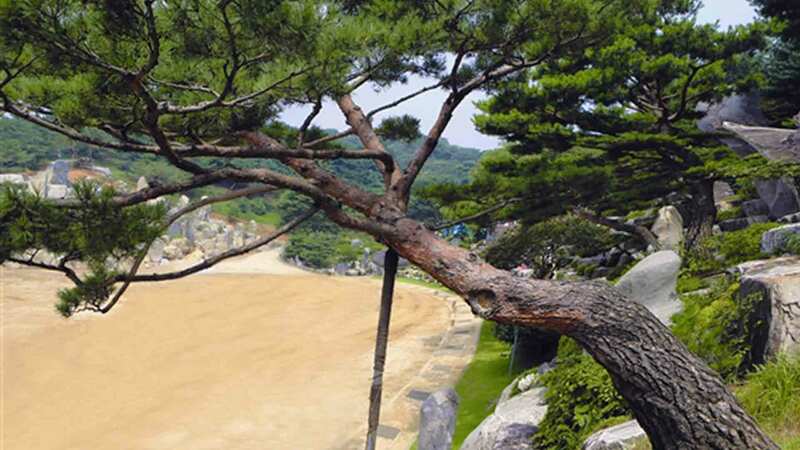 The Jehovah Jireh Pine Tree is a red pine Pastor Jung Myung Seok found after winter had ended. Pastor Jung wanted to bring a black pine he found before, but it had fallen over in the winter. So he raised and managed this red pine in place of the tree that had died. As time passed and as he continued to develop Wolmyeongdong, he came to need a pine tree. That was when the black pine tree he spotted the previous year came to mind. So he returned to the field with an excavator and some of the workers. But as he approached, he couldn’t see it. Feeling uneasy, that someone might have cut it down, he dashed towards the tree. Since he promised the tree and the Lord that he would come back to prune and take the pine to Wolmyeongdong, he felt at a loss. He also didn’t want to go back empty handed since he had come all the way with the excavator. A round trip from Wolmyeongdong to the field was 800 m, and grass covered the path. So he looked around again and noticed a tree covered in arrowroot vines. After clearing off the arrowroot, he discovered this red Gaburi pine tree (i.e., a tree with a slanted trunk from the ground). It looked much better than the black pine that had fallen. The word “Jehovah-Jireh” (i.e., God provides) just fell out of his mouth. They decided to take it, so they dug it out and transplanted it in Wolmyeongdong. Because it has been managed and fertilized well, it has now become a large tree. God gave Pastor Jung the Jehovah Jireh Pine Tree in place of the black pine that had died. If the black pine had survived, the Jehovah Jireh Pine Tree would have been impossible to find and transplant because of how it had been covered in arrowroot vines. Through this story, we can come to realize the Will of God. Just as in this story, Pastor Jung encourages us to never feel depressed and to never give up when we fail to fulfill our responsibilities. If it is God’s Will, He will surely provide something better.